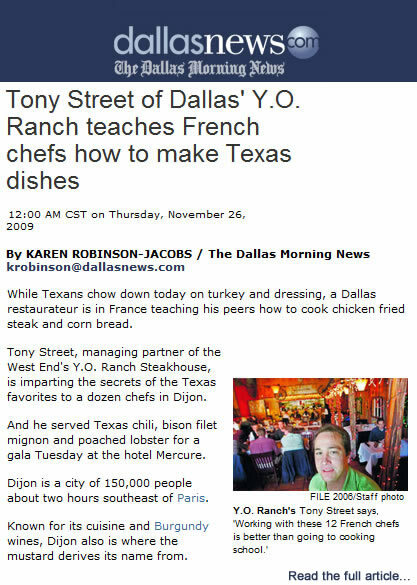 Dallas Chef Tony Street, was recently featured in the Dallas Morning News, in connection with his trip to Dijon, France to cook a Texas-themed Thanksgiving feast for 300 Gala attendees at an event honoring Charles Rivkin, U.S. Ambassador to France. In addition to cooking the Thanksgiving feast, Street also cooked 5-course gourmet dinners throughout the week as part of the the Mercure Hotel’s Texas Restaurant Week. Tony Street owns a Steakhouse in Texas. It is said to be one of the best private dining Dallas experiences. Many people go searching for the best private dining Dallas and they usually end up right at Tony Street’s Steakhouse as his food just can’t be beat with it’s impossibly great flavor and quality. He takes private dining Dallas to a whole new level just with his Steakhouse’s amazing venue. The venue is very classy with gorgeous Texas Décor draping the walls. If you’re looking for that private dining Dallas experience that everyone is talking about, the Y.O. Steakhouse is a place everyone should experience at least once, that is if you don’t get hooked on amazing food, large selection of wine, and the best desserts you’ve had in your life. So when it comes down to it, the Y.O. Steakhouse is the number one spot to dine if you want an exquisite experience with their private dining Dallas.